My Hebrew birthday is in Tevet, smack in the middle of the month of December this year. Yet I was born in January, which makes me a capricorn…confused? In my case, I happened to be born in a year that the constellation aligned with both my Hebrew and secular birthdays, but this isn’t always the case. Tevet is the month of the capricorn, or g’di. And so it goes for the astrological signs, they each correspond to one of the Hebrew months in the lunar year. Because the signs follow the moon, they shift in accordance to the Gregorian calendar. This means that the capricorn constellation sometimes falls in line during January and sometimes in December, often it will overlap, but it never conforms to the zodiac dates you know from your morning paper. You may have been born under a different constellation than the one you think. It is interesting to note that the correspondence of dates is shifting gradually, by approximately one day every 200 or so years. This means that 80,000 years from now, capricorn, or the month of Tevet will fall in November (this shift is also the reason that the next thanksgivukah will happen in the year 79,043). 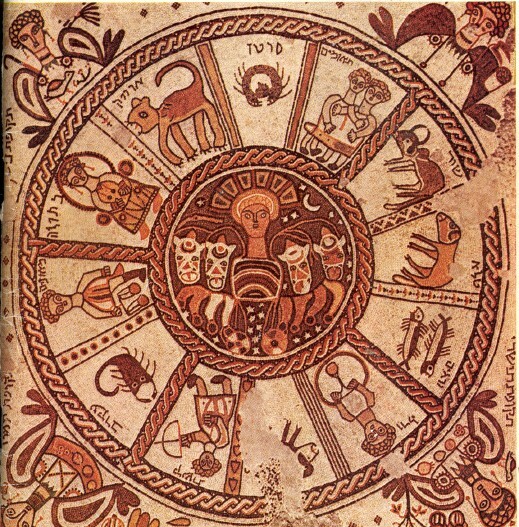 Many people don’t realize that the zodiac does not come from Roman or Greek tradition, but rather from Jewish tradition. The misconception stems from the fact that most of the other constellations or celestial bodies were named either after Greek or Roman mythology. Names like Andromeda, Orion, Cygnus or Hydra from the Greek myths color our view of the constellations. The planets, Mercury, Venus, Mars, Jupiter, Saturn, Neptune, Uranus, and even Pluto are named after the Roman pantheon. The twelve signs of the zodiac, are different, however. 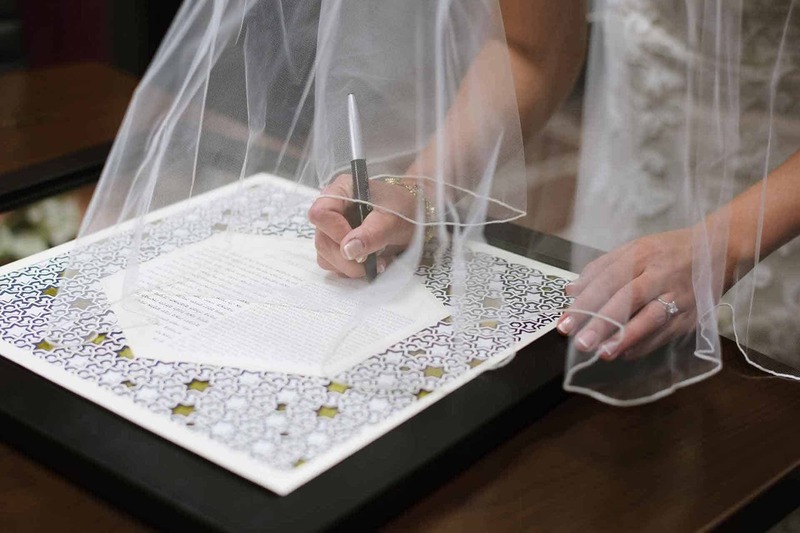 They were written in the Talmud thousands of years ago, but were named long before that. Nisan is Taleh, the Ram, belonging to the tribe of Judah. This is the month of Passover, when we made the sacrifice of the lamb to be passed over by the angel of death. Sivan is Teumim, the Twins belonging to the tribe of Zevulun. This is the month of Shavuot, during which we received the twin tablets at Sinai. Tamuz is Sartan, the Crab, belonging the tribe of Reuven. Av is Arieh, the Lion, belonging to the tribe of Shimon. Elul is Betula, the Virgin, belonging the tribe of Gad. This is the month of purity when we spiritually prepare for the high holidays. Tishrei is Moznaim, the Scales, belonging the tribe of Ephraim. This is the month of Rosh Hashana and Yom Kippur , during which we face judgment. Cheshvan is Akrav, the Scorpion, belonging the tribe of Menashe. Kislev is Keshet, the Archer, belonging the tribe of Benjamin, the warriors. Tevet is G’di, the Goat, belonging the tribe of Dan. Shevat is Dli, the Water Vase, belonging the tribe of Asher (literally wealth). This month signifies the end of the rains and the bounty is celebrated with Tu b’Shevat. Adar is Dagim, the Fish, belonging the tribe of Naftali. There is a distinction to be made here. The reason we are not to look heavanward for our path is because we were given the gift of making our own path in this world — something we have that the angels to not — and even if our path is written (the classic paradox of free will) we should still live our lives as though it is not. 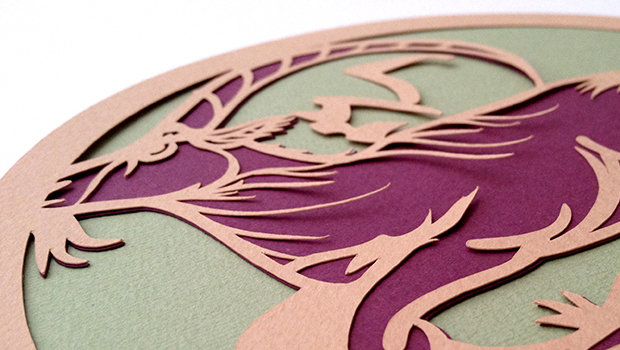 I created this papercut in honor of the Jewish zodiac. 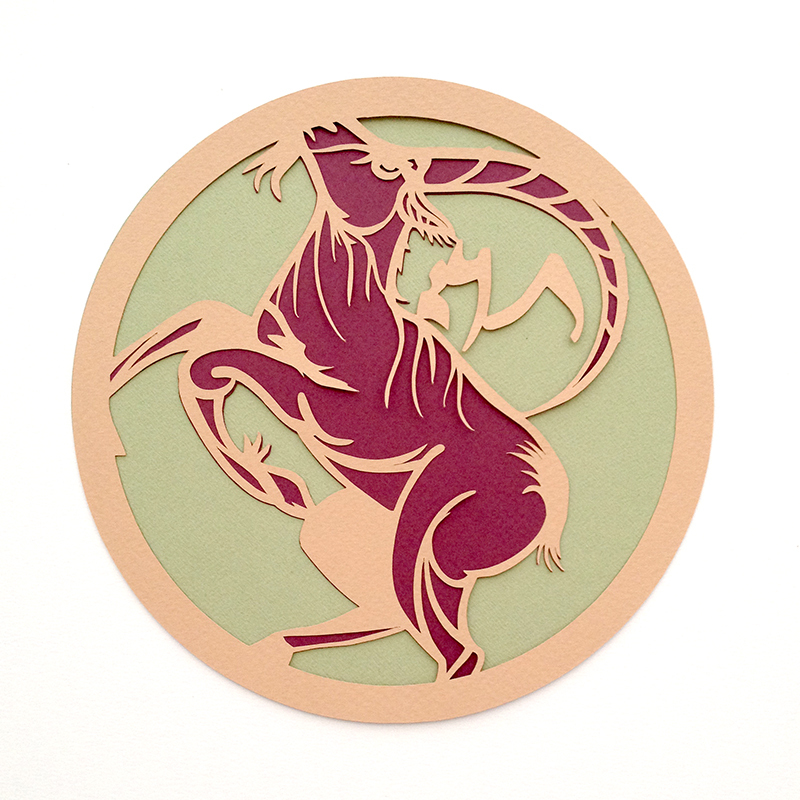 It is a capricorn. If you would like to purchase one, or any of the other zodiac symbols, send me a message using the form in the contact page.